Boston.com did a profile of Shaquille O'Neal and they learned more about his girlfriend Nikki "Hoopz" Alexander. The couple did a two-on-one in an interview with The Globe’s Meredith Goldstein for a Home & Lifestyle section cover story. Hoopz is a workout queen and in great shape. She's signed-on to do a reality show based on women's health and fitness. She will be showcasing her own health in fitness in her new suburban lifestyle. Hoopz brought her two dogs to the house in New England. One is the doggie Shaq bought her a white lab named Koty after one of her dogs was fatally hit by a car. They still won't confirm an engagement or if they want marriage. Shaq said "I'm not going anywhere. She's not going anywhere." 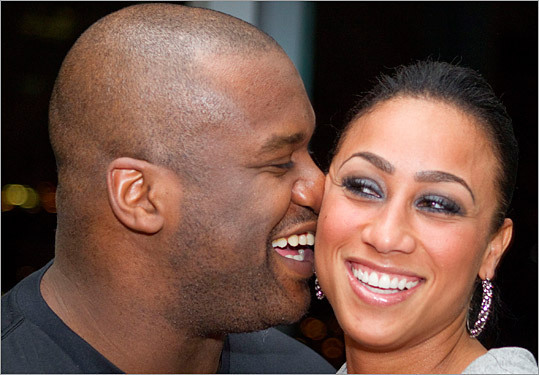 Hoopz is 5'2 and more than 2 feet shorter than Shaq. Hoopz has her own "female dungeon" at the top of the house--complete with fantasy and girlie things and a tiny bathroom like "Alice & Wonderland." They watch a lot of tv together and cannot stop laughing around each other. Nothing's taken too seriously.